The indoor pool in the Thermae Sylla Spa hotel is fed by a private natural hot spring. 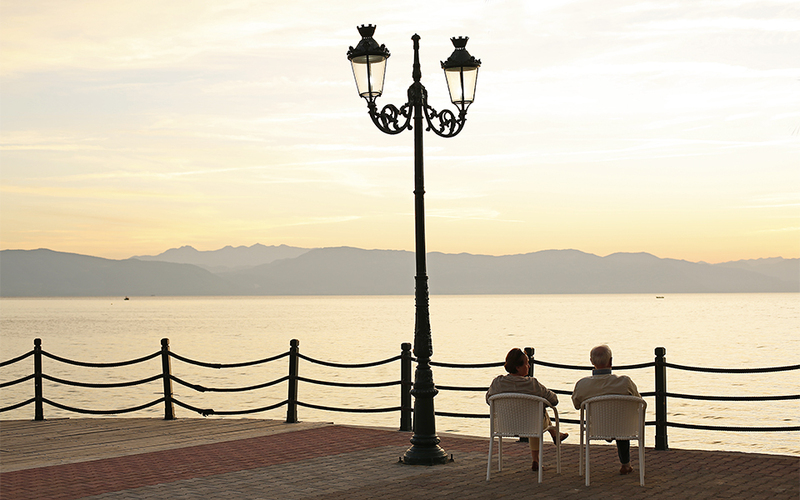 A couple enjoys the sunset on the waterfront of Loutra Aidipsou in front of the hotel Thermae Sylla Spa. 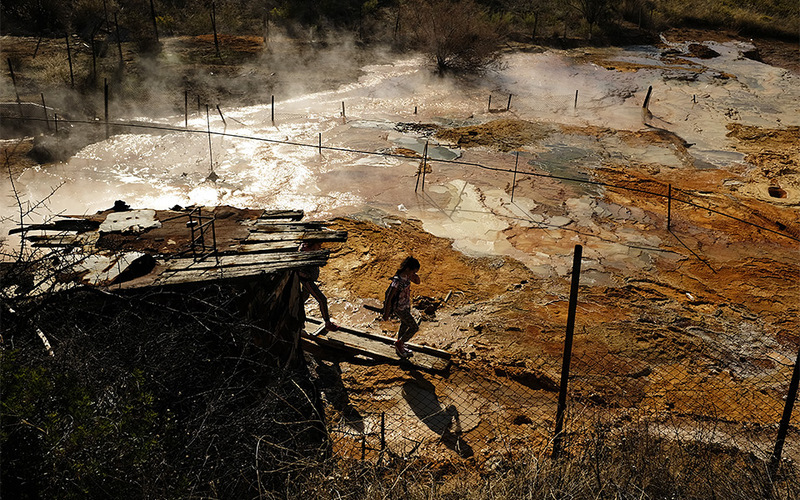 The hot springs on the seafront in Loutra Aidipsou. 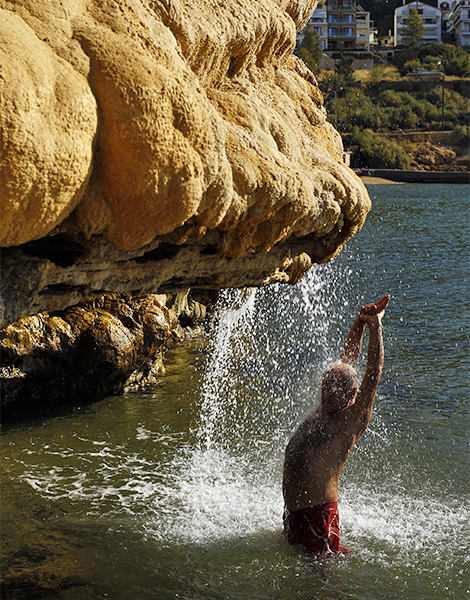 A natural hot spring creates a small waterfall spilling into the sea. The waterfall is found roughly halfway between the Thermae Sylla Spa and the Kastalia building. The outdoor pool of the hotel Thermae Sylla Spa, which is filled with natural spring waters. 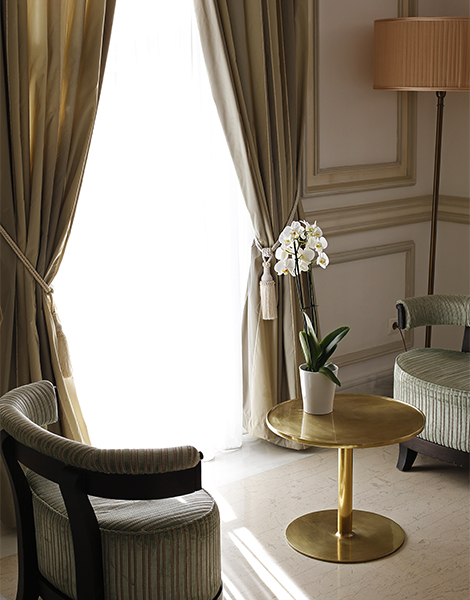 The interior of the Thermae Sylla Spa exudes timeless luxury. Treatments start at 10 euros see www.thermaesylla.gr for more information. Evening falls in Loutra Aidipsou. The octagonal "Kyma" - a café turned exhibition space built out over the water. Taking a bike ride along the town's main road. Loutra Aidipsou is 15 km from Gialtra and 32 km from Kavos. 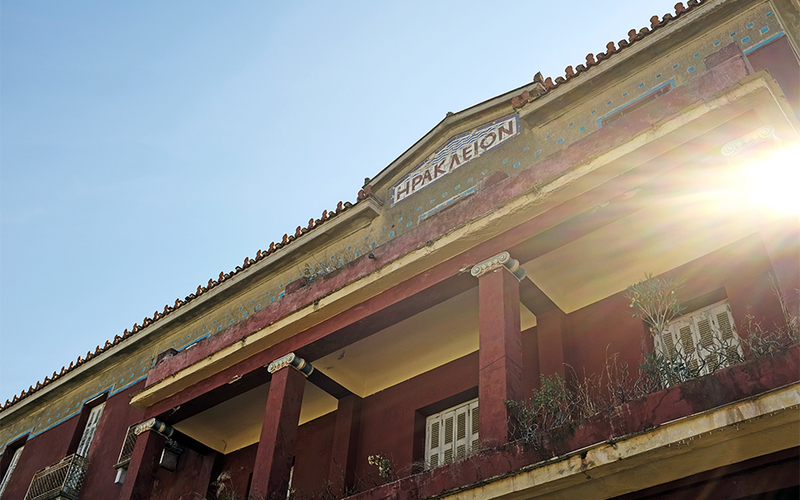 The Irakleion, a once grand but now abandoned hotel and spa. 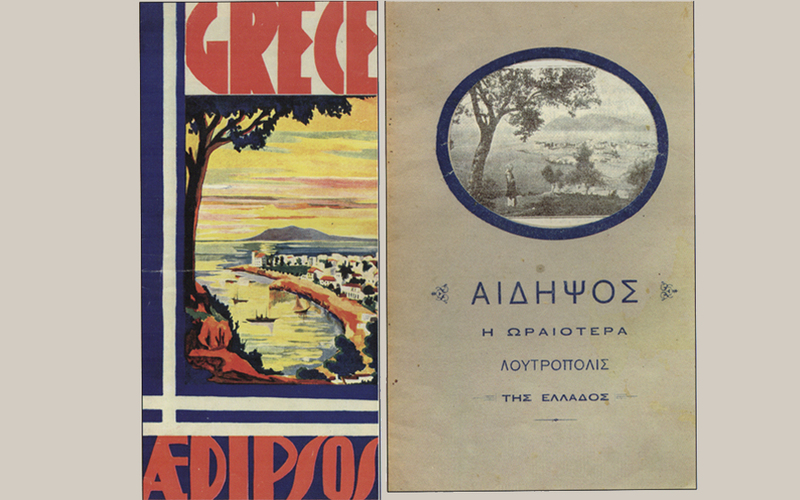 An old advert for Aidipsos, "The Prettiest Spa Town in Greece". 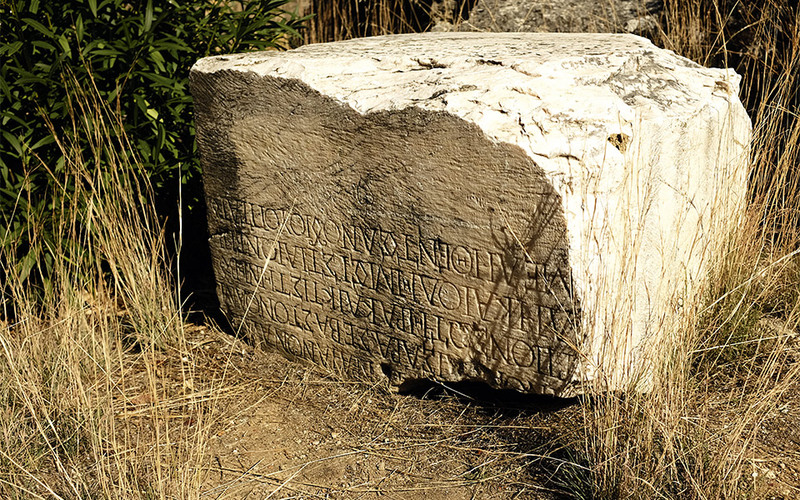 An ancient inscription located in front of Sylla's Cave, where Roman-era baths have been discovered. 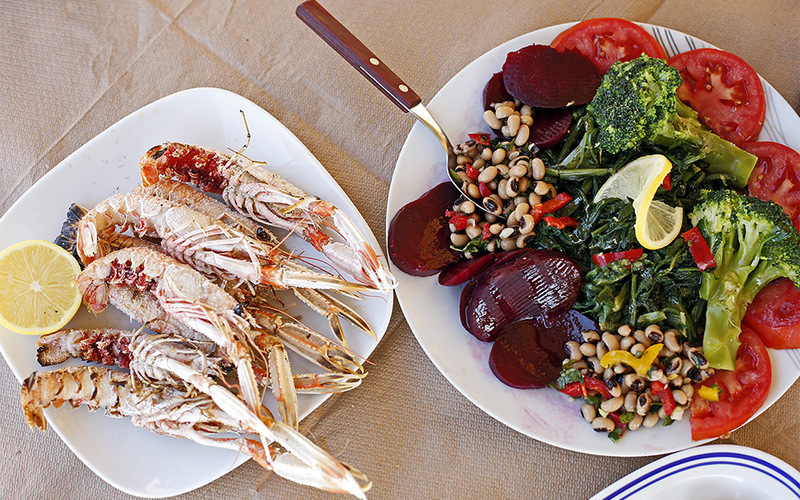 Fresh salad and prawns at the taverna Sta Kala Kathoumena in Oreoi. 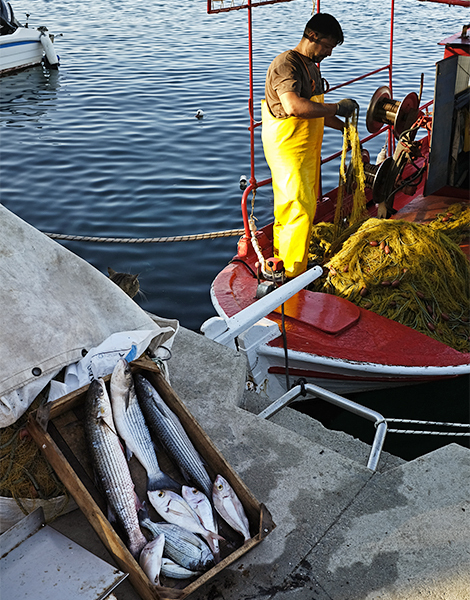 Head to the harbor in the morning to buy freshly caught fish straight off the boat. Aidipsos is a 185 km drive from Athens via Chalkida (about 3 hours). Alternatively you can drive to Arkitsa (155 km) via the Athens – Lamia national road and get a ferry from there to Aidipsos. There are 6 boats per day and the crossing lasts about 45 min. Tickets cost 3.70 euros per person and 16.80 euros for a car. 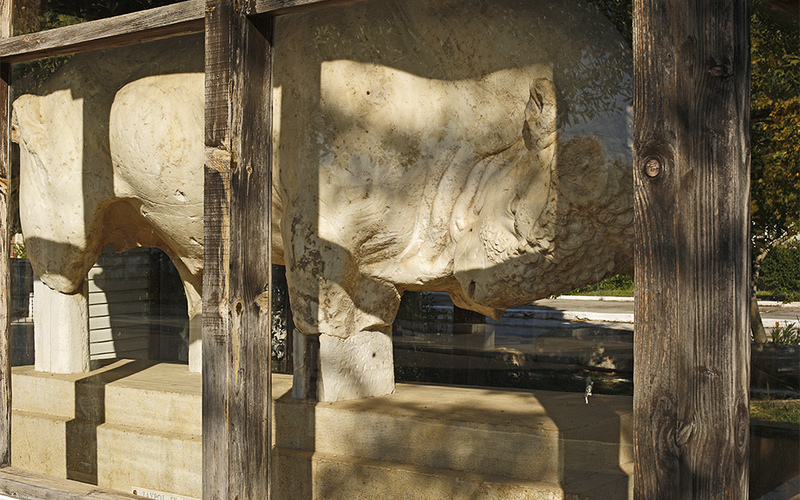 Edipsos Ferris, tel. +30 22330.91121, www.ferriesedipsos.gr. 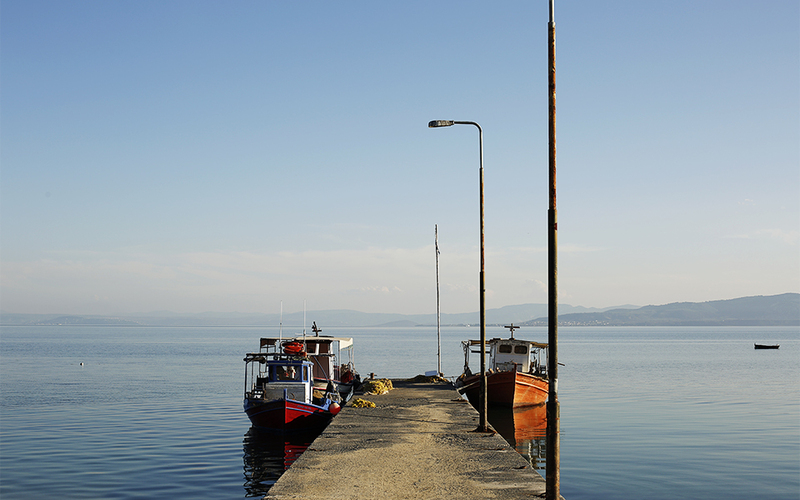 For those traveling from northern Greece, ferries sail from Glyfa. 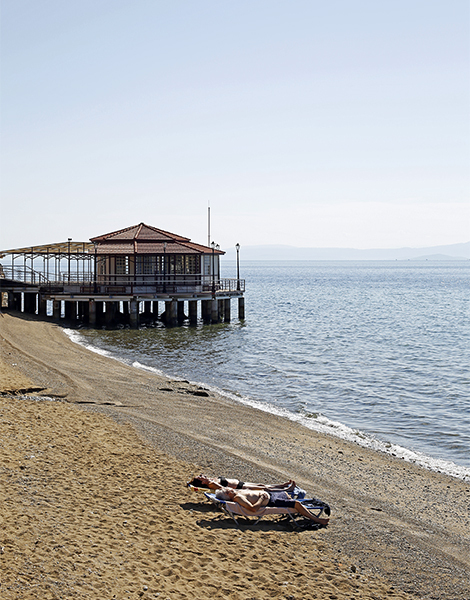 At around the 240th km on the Thessaloniki – Athens road take the exit for Glyfa and after 13km you will arrive at the port. The ferry will take you to Agiokampo, about 10 km away from Loutra Aidipsou. There are six boats per day, and the crossing takes about 20 min. Tickets cost 2.50 euros per person, 13.30 euros per car. Glyfa Ferries, tel. +30 22380.61391, www.ferriesglyfa.gr. Thermae Sylla Spa, (2 Poseidonos, Loutra Aidipsou, tel. +30 22260.60100, thermaesylla.gr). 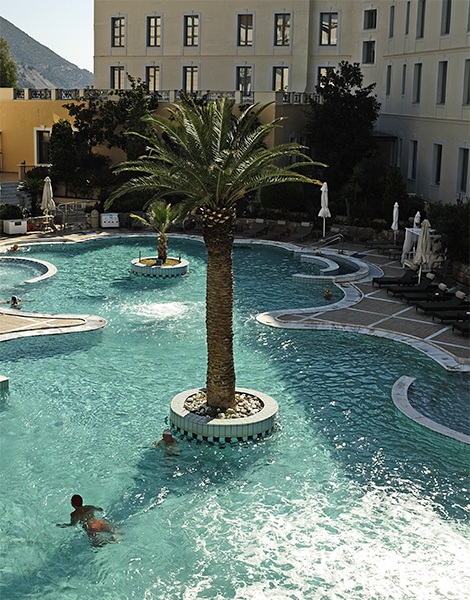 The most complete spa center in Aidipsos, with two large pools filled with water from the privately owned hot spring, one outdoor and one indoor. 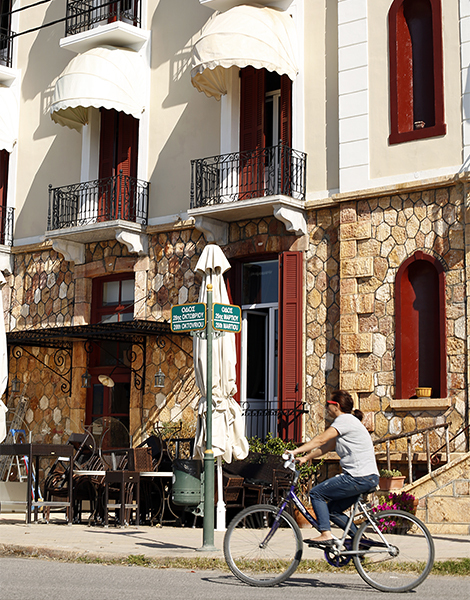 The historic hotel that dates to the early 20th century is also fabulously situated directly on the seafront. The rooms are comfortable, brightly lit and with a full suite of amenities. The breakfast and restaurant are also pluses, serving Mediterranean dishes made from ingredients sourced from the hotel’s own farm. From 120 euros for a double room including breakfast, use of the pool, gym, aqua aerobics and one medical consultation. 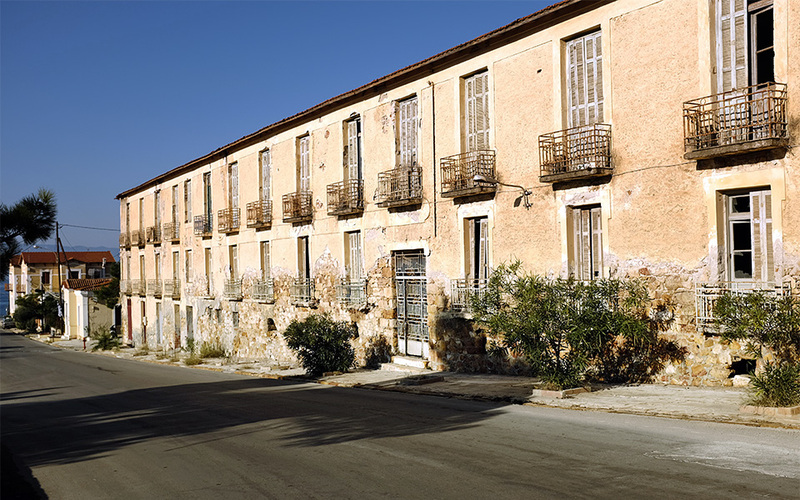 Aktaion Hotel, (28 Oktovriou and Thermopotamou, Loutra Aidipsou, tel. +30 22260.24332, www.aktaion-edipsos.gr). Located in the middle of the coastal road, the stone building houses spacious and atmospheric rooms with modern bathrooms and sea views. From 50 euros for a double room with breakfast. Anemolia Studios, (Frynis, Loutra Aidipsou, tel. +30 22260.60079, www.anemolia-studios.gr). 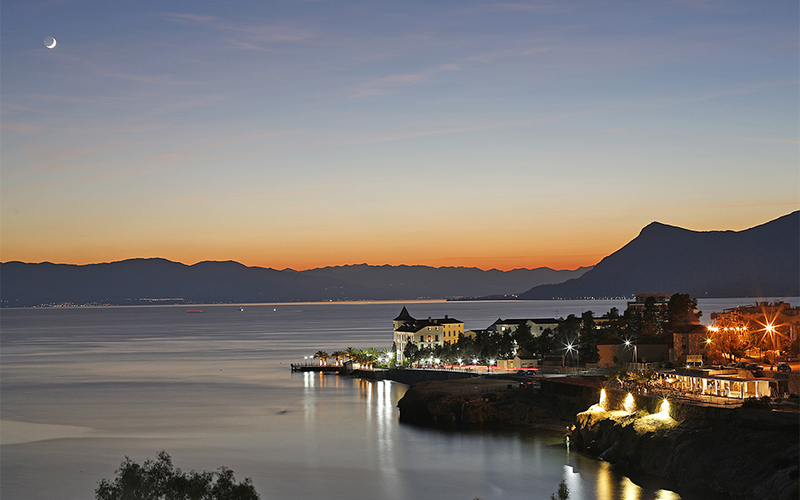 Exceptional views of the sea and the town with small apartments for groups or families. From 55 euros for a double room with breakfast. Alkistis, (26 Artemisiou, Loutra Aidipsou, tel. +30 22260.24727, www.alkistis-aidipsos.gr). Simple and minimal rooms over two floors with balconies. From 30 euros for a double room with breakfast. For good grilled local meats and slow-cooked dishes head to Kalyva (Thermopotamou and 6 Ploutarchou, Loutra Aidipsou, tel. 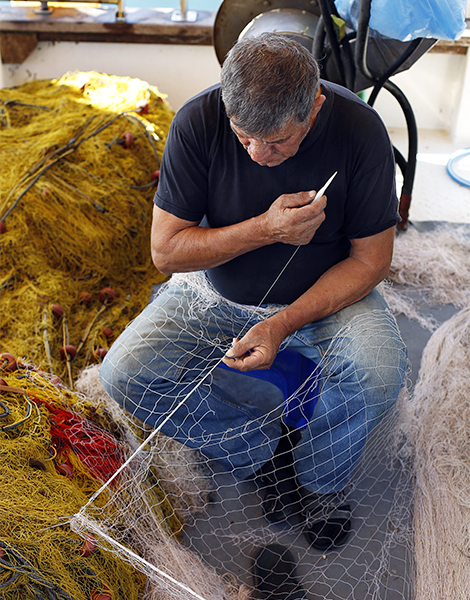 +30 22260.22735), for fresh fish to Noufara (1 Omirou and 28th of October, tel. +30 2260.22752) to Maraveli (Paraliaki, Aghiou Nikolaou, tel. +30 22260.60240) and Sta Kala Kathoumena (Oreoi, tel. +30 22260.71701). For pizza and pasta dishes go to Palatino (28th of October, Aidipsos, tel. +30 22260.60707), for burgers, sandwiches and coffee all day and beers and drinks in the evening to Old House, (4 28th of October, Loutra Aidipsou, tel. +30 22260.60606).